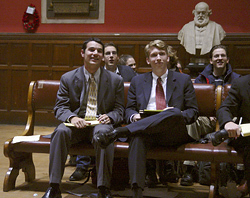 In mid-November, Bates traveled to inter-varsity debate tournaments at Oxford and Cambridge universities, where the Bates team of Ryan Creighton ’07 of Lyme, N.H., and Mike Neville-O’Neill ’07 of Rowley, Mass., took second place out of 100 teams competing at Oxford. At the end of December, Bates sends two teams (Creighton and O’Neill compose one team, Vaibjav Bajpai of Calcutta, India, and Casey Pfitzner ’07 of Spotsylvania, Va., the other) to Malaysia for the 2005 World Universities Debating Championships. Accompanied by coach Brito and Brooks Quimby Debate Council president Collin Keyser of Pennsburg, Pa., the Bates teams will compete against more than 300 teams from all over the world.